The Cooperative Research Centre for Water Sensitive Cities (CRCWSC) has just released two publications from their project C4.1 Integrated multi-functional urban water systems. Stormwater biofilters (i.e.raingardens or bioretention systems) and constructed wetlands are regarded as two of the most promising water sensitive urban design (WSUD) technologies. This project looks at the potential for hybrid WSUD systems that could treat multiple water sources such as stormwater, greywater, partially treated wastewater and polluted groundwater. It focuses on recycling water from multiple water sources in urban areas and optimising stormwater biofiltration and wetland systems to better protect our waterways and cool our cities. This report presents the research outcomes from Project C4.1. It is divided into four sections - green treatment technologies, findings from field testing, assessment of the cost-benefit analysis, and review of the different technologies. Green infrastructure is being highly viewed as a sustainable development strategy as it integrates local water management with urban greening. 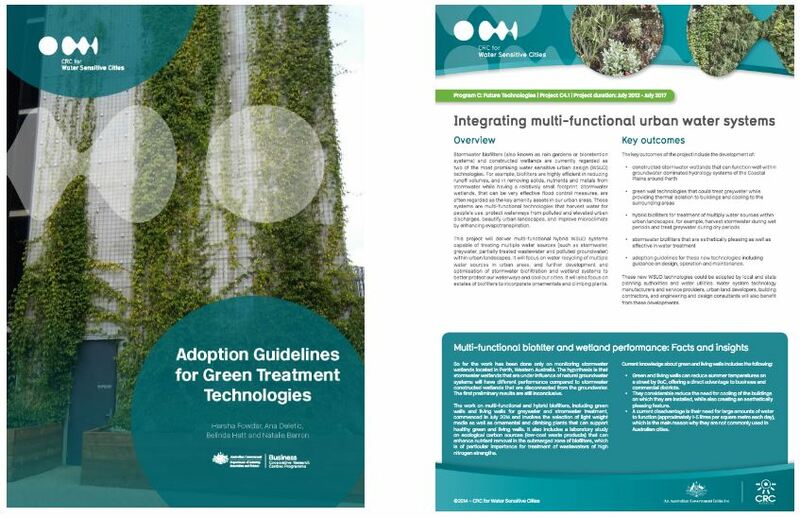 This guide provides information on how to design, operate and maintain these green wall and façade systems to maximise their water treatment benefits to increase the sustainability and liveability of cities.